Travel across the Peek-a-Boo Sea, through a world of nursery rhyme adventures to the Land of Wishes and Dreams with Archie the Mouse, Peter Bear, Michael Finnegan, Incy the Rain Spider, Ivor the Giant, Old King Cole, Molly Perfect and many, many more wonderful and enchanting characters. 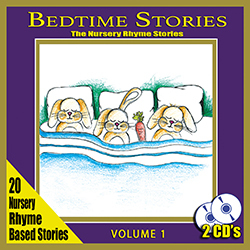 This audio collection of short bedtime stories has been put together for the enjoyment of children when settling down to relax or helping them get to sleep. Each story has been lovingly written by four different authors and each is based around the theme of a particular nursery rhyme. Your stories are read by Peter Bradbury with his wonderfully soothing voice and Peter‘s words are accompanied by beautiful music all taken and remixed for this product from the hugely successful The Nursery Rhyme Collection Volumes 1-8. Your stories have differing paces and are split across two disks, Disk 1 containing the more engaging and adventurous stories whilst Disk 2 contains the more softer and sleepy stories. Your stories are intended to be more stimulating at the start of each disk with the feel and pace of each story reducing one by one, creating gradual relaxation to help soothe your child to sleep. We hope you and your children enjoy these stories together and find them effective when relaxation is required, perhaps on that long car journey or simply at resting and bedtimes. 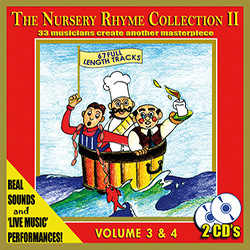 All music is taken from the Nursery Rhyme Collections, Volumes 1 - 8. Our collection of Bedtime Stories stories is based around some of the most loved Nursery Rhymes. Here you can listen to excerpts of all stories (narrated by Peter Bradbury) and also some stories in full. You can read along with every story online on our website or you can download all story texts and soundtracks individually (MP3 + PDF). In addition, all 20 stories are available together as an illustrated eBook with audio included (our full package download).